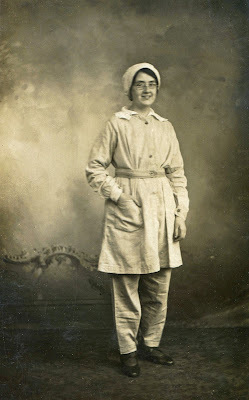 This photo of my great grandmother Clara Ward was taken almost a century ago, and shows her in her munitions uniform. It tells a story of a young girl carrying out heroic work during WW1, literally risking life and limb as well as being slowly poisoned by the chemicals she had to deal with. While I can’t be 100% certain, I think she was one of the “Barnbow Lasses” – the 16,000 strong, mostly female workforce at Barnbow Munitions factory in Leeds. About a third of the workers were from Leeds itself, but others were brought in from Wakefield, where Clara lived, together with Harrogate, Castleford and outlying villages. Thirty-eight trains a day, known as the Barnbow Specials, carried the workforce to and from the factory, where they would work a shift pattern to keep the production line running 24 hours a day. They worked six days a week, with one Saturday in three off, and no holidays. Working conditions were poor. As well as the long hours, food rationing was severe. Those working with explosives had to strip to their underwear and wear smocks and caps. Everyone wore rubber soled shoes. No hairpins, cigarettes, or matches were allowed. The risk of explosion was huge, and it did happen. In 1916, a violent explosion rocked through room 42, where shells, already filled with high explosives, had fuses inserted and caps placed on them. Thirty five women were killed and many more maimed and injured. Due to censorship, the news was never made public. There were other, smaller explosions too. In addition, the cordite in the explosive would turn workers’ skin yellow, giving them the nickname the Barnbow Canaries. They often suffered stomach, eye and throat problems, and their babies were born yellow. The cure for the yellow skin was to drink lots of milk, and the factory had their own cows on site – 120, producing 300 gallons of milk a day. 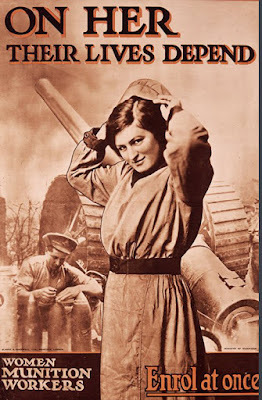 The women munitions workers did skilled jobs, in demanding and dangerous conditions, but after the war had to return to their roles at home, with little recognition of the work they had done. On the 100th anniversary of the 1916 explosion they did receive some acknowledgement, with a memorial and plaque commemorating those who lost their lives being unveiled in Leeds. Clara married in September 1918, and to my knowledge she didn’t work again after the war. She died in 1965, six months after I was born. This photo is the only one I have of the two of us together. It was taken just a few weeks before she died. 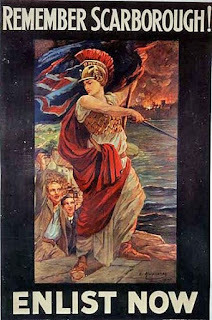 On December 16, 1914, 137 people were killed and 592 injured when the Germans raided Scarborough, Hartlepool and Whitby. The area had been identified a month earlier by the Germans as one with very little coastal defence in place. Shelling of Scarborough from German battleships began at 8am on the 16th. The castle, the Grand Hotel, three churches and other properties were hit. At 9.30 am the battleships moved onto Whitby, hitting the coastguard station, the abbey and other properties. Hartlepool was a much more significant target, and shelling of that began at 8.10am, with targets including the steelworks, gasworks, railways, churches and 300 houses. Eighty-six civilians were killed and 424 were injured in just 40 minutes, as well as some military casualties. 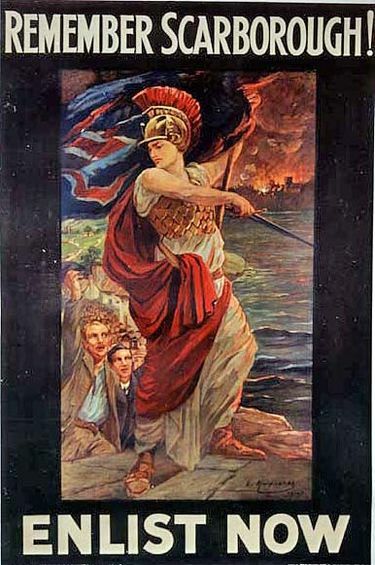 One of the enlistment posters produced after the East Yorkshire raids. More than a thousand shells were fired during these raids, and afterwards the attack became part of a British propaganda campaign. You can read more about the raids here. These raids proved just how important it was to have - and maintain - defences along the East Coast. Which, no doubt, is how my great grandfather George William Bottomley ended up in the East Yorkshire Regiment's 5th Cyclist Batallion, playing a vital part in that defence work. Bicycles were considered an important asset to the military in those days, and they would have offered an ideal way of keeping a close and regular eye on all parts of the coast, from the busiest to the most remote. It must have been a hard job. Cycling along the East Coast in all weathers and at all times. Not as hard as being at the front, perhaps, but difficult nevertheless. Which may well explain why George was invalided out two years later with rheumatism and heart problems. He had suffered from rhuematic fever some years earlier, but the harsh conditions probably didn't help. At the time of his medical discharge he weighed just 8 stone and 2 lbs. George was awarded the Silver War Badge,which was given to men who became ill or wounded while in service in the UK or overseas. 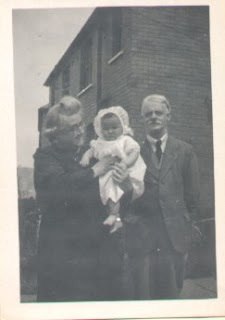 George William Bottomley with wife Clara and grandaughter Maureen (my Mum). George was born in Ossett, West Yorkshire, in 1888 to Thomas William and Annie Bottomley. By the age of 13, he was working in the town's fireworks factory, Messrs Riley & Sons. He clearly had quite a few different jobs in his time. in 1911, he is shown on the census as being a tramcar driver. Five years later, when he was called up, he was a barman. In the newly released 1939 register he is listed as a "baker and hawker on his own account", and when my grandmother, his only child Elsie, was born, he was a confectioner. George died relatively young, at the age of 60, from stomach cancer. Last year, I wrote about my gt x 3 uncle Henry Womersley, father of 13 and a miner who died in Featherstone Colliery in 1902. At the time, I didn't know how he had died, but thought maybe he had just collapsed given that I couldn't find a record of any pit accidents there that year. It turns out that I was wrong, and so the record needs to be put straight. In fact, the poor man was crushed to death under 15 tons of stone and rubble while helping with blasting operations. Yesterday Major Arundel, coroner, conducted an inquiry at the Featherstone Hotel touching the death of Henry Womersley, bye-workman at Featherstone Main Collieries but living in Kinsley. Deceased met his death after assisting in blasting operations in the Haigh Moor seam of the colliery on Wednesday. The body was identified by Thos. Womersley, son of the deceased who said his father was 54 years old, and left a widow and three other members of the family. Evidence as to the cause of death was given by Jos. Green (Pontefract) a colliery workman, and Albert Roberts, a deputy. Their statements showed that on Wednesday deceased was employed with other men blasting stone in the seam, that Roberts fired a shot in the side of the road which worked well and that two minutes later Roberts examined the roof and sides in the vicinity of the shot and found all safe except some loose stone in the side which he instructed deceased to remove. Deceased was unable to remove the loose stone with his pick, and was about to fetch an iron bar when suddenly the side of the road fell in, bringing with it the props and crushing him terribly. There would be some fifteen tons of stone and muck fall. Before the accident--evidence also showed the place was properly timbered, the fall being due to a slip in the roof which gave way. The jury returned a verdict of “Accidently injured”. There were present at the inquiry Mr W H Pickering, Chief Inspector of Mines, and Mr P Darlington, manager of the colliery. On a happier note, I also discovered that one of his children, Henry jr, was even more prolific than his father. Henry jr had 19 children - yes, 19! - including two lots of twins born just 16 months apart! Many thanks to Hilda, my second cousin 3x removed, who got in touch with me after seeing my family interests in the Huddersfield and District Family History Society's regular newsletter. Just goes to show it is always worth putting your name and interests out there, you never know who is going to see them! Thomas William Bottomley is my Mum's great grandfather. He is one of those ancestors who seems to have lived a fairly ordinary life. No drama, he just seems to have focussed on working hard all his life and providing for his family. But that doesn't mean he isn't worth remembering - far from it. To me, genealogy isn't about highlighting your famous or infamous ancestors, it's about remembering them all. And this rather grand photo I have of him, courtesy of a distant relative who was happy to share it with me, is definitely worth showing off. 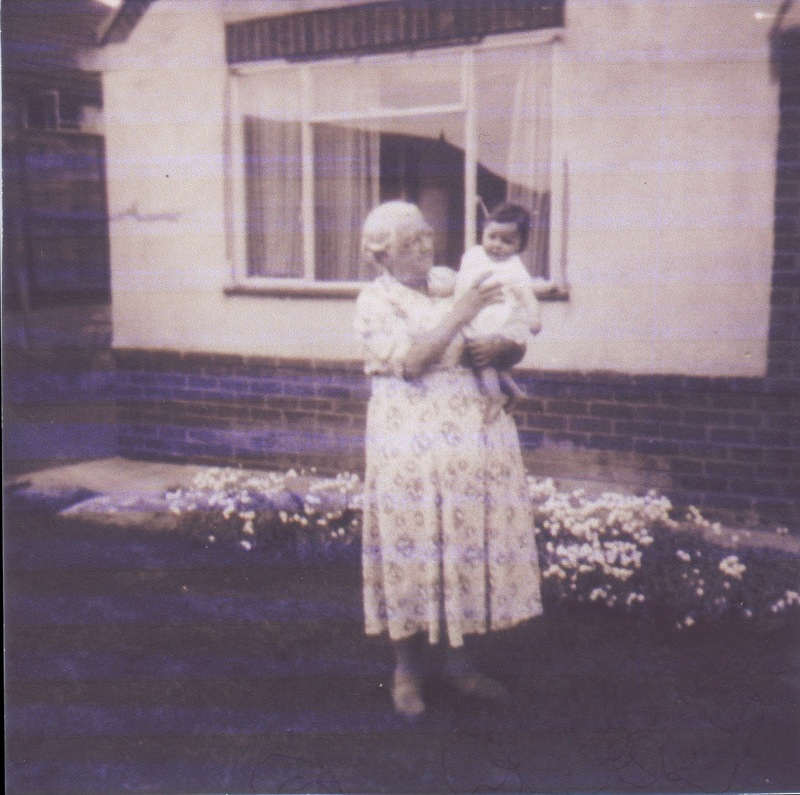 Thomas was born on February 3 1865 in Owl Lane, Ossett, Dewsbury, to Matthew and Ann (nee Bates). He was the youngest but one of six children, born when his father was 47 and his mother was 34. He is shown on the 1871 census, when he was just six years old. He was still living in Owl Lane, Ossett with his father and mother. His father was 53 at the time, and working as an overlocker in a worsted mill. His mother was 40 and was born in Wakefield. He shared his home with siblings Eliza Ellen, 18, who was working as a twister of yarns; George, 16, who was a packer; Sarah Ann, 14, also a twister; Emily, 8, who along with Thomas were at school; and Ada Elizabeth, 3. Ten years later, both of Thomas's parents have died, but the family has stuck together. The eldest son, George, is head of the house and working as a worsted packer. His eldest sister Eliza is already widowed, and living back with her siblings, working as a worsted doubler. Sisters Sarah Ann and Emily are both rag sorters, and Ada is still at school. Thomas appears to have done fairly well for himself, as he is a worsted overlooker (supervisor) already. Notice how they are all involved in the town's main industry - mungo and shoddy. This is essentially the business of recycling rags and cloth. The rags would be sorted according to colour and quality; cleaned, and wool would be extracted. That wool would then be used to make new fabric for clothing. At one point Ossett and it's neighbouring towns were an international centre for wool recycling, receiving rags and cloth from across Europe. In 1887, Thomas married Annie Dews, and four years later the census shows him working as a wool extractor. He is the father of George William (Mum's grandfather), aged 3, and Clifford, aged 1. They were living in Tattersfield Street, Ossett. By 1901 Thomas and Annie had six children - George, Clifford, Fred, Harry, John and Edward. Their last child, Wilfred - who I remember as Uncle Wilf - was born in 1902. In the 1911 census, aged 46, Thomas was still in the mungo and shoddy business, as a rag shaker. George, 23, was still living at home and was a tram car conductor, Harry, 17, was a coal miner, while John, 12, Edward, 10 and Wilfred, 8 were all at school. Clifford was already married and working as a coal miner, and Fred was a butcher with the local Co-op and a member of the Territorial Forces. Thomas's wife Annie died in 1924 aged 55. Thomas lived a lot longer, dying at the ripe old age of 85 in May 1950. George Garner had more than a touch of wanderlust in his blood. While his relatives stayed put in his home county of Nottingham, George was clearly determined to see more of the world, and ended up about as far away from England as it is possible to be, in New Zealand. George, my great great grandfather, was born in Hucknall in 1858 to Eber (featured in last week's blog) and Mary Ann Garner. The census of 1871 shows that at 13 he was still at home, and working as a winder, winding hanks of thread onto bobbins for his father and elder brothers to use for their framework knitting. By the age of 23 the desire to travel had clearly kicked in, and he was working as a bricklayer in London, where he met his wife Mary Goodwin. They married at St James' parish church in Clerkenwell on December 5 1880. George and Mary’s first child, George Alfred Eber, was born within the year, in Islington, London. The family evidently moved back to Hucknall at some point over the following year, where John Edward (my great grandfather) was born in 1882. George and Mary’s story goes a little hazy now, as nothing is known of George until he emigrated to Australia and re-married, leaving both of his children behind with relatives. His re-marriage, and the fact that his two sons had to go to other members of the family, convinces me that Mary Ann must have died, even though I've not yet been able to find a record of it. 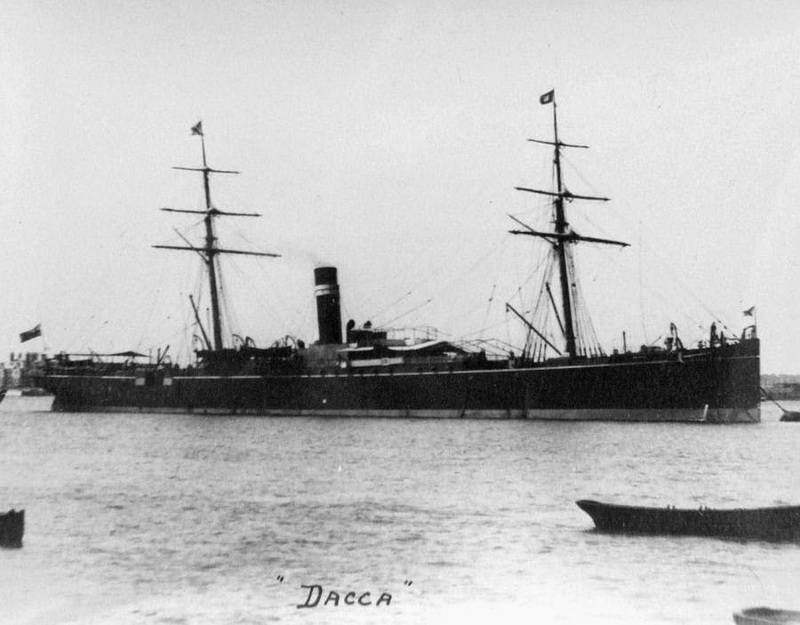 Records show that George and his wife-to-be Ellen Kirby Tomlin left London on 5 June 1886 on the SS Dacca, a steam ship, and arrived at Brisbane in Queensland, Australia on 24 July 1886. They both travelled under the name Garner, although they weren't yet married. I suspect that this, together with leaving his children behind, were probably due to Queensland’s immigration rules. Although they did change over the years, there are rules from 1856 which say that single men and widowers could not be accepted, nor could families with two children or more under seven years of age, or in which the sons outnumbered the daughters. Clearly as a widower with two young sons George fell into all of these banned categories. The journey over must have been pretty grim. George was lucky enough to get a free passage from the Australian Government, but of course this still meant he and Ellen were in steerage. A partitioned space of about 6' by 3' was allowed for a couple, and they were asked to keep to that space. They rarely went on deck, being largely confined to their cramped quarters. Portholes, if there were many, tended to be kept closed. So George and Ellen would have spent about seven weeks in poor light in extremely cramped conditions, shared with goodness knows how many other people. Many of whom would have been seasick, and no doubt personal hygiene wasn't great either. Food was basic, and there were daily rules to abide by including when to get up and when it was time for lights out. You can read more about the type of travelling conditions on this blog. Despite the inevitable difficulties that must have arisen from being in such close quarters and awful conditions for weeks on end, George and Ellen made their partnership official a month after arriving in Australia, when they married at Oxley in Queensland on August 21. They settled in Queensland, and George worked as a builder/contractor. They had five children here, Alice, Arthur, Rose, Arella and James. Sadly Arthur died in 1899, and Alice died in 1905. 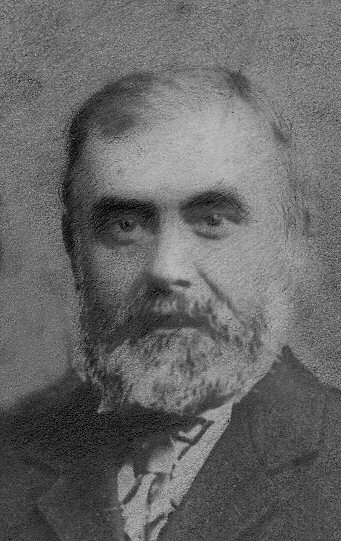 George's elder son George Eber joined him in Queensland, probably around 1897, but James Edward stayed behind in Leicester, where he lived for the rest of his life. Interestingly, George's Australian-born descendants never knew of John Edward and didn't realise they had relatives in England. Until a month or so ago, when my cousin Sam made contact with Wendy, the granddaughter of John Edward's half brother James. We have all been exchanging emails since then, and it is largely due to these emails that we have been able to put together a much more comprehensive picture of George's life. To get back to George, he and his family moved to New Zealand in 1905, with George working in Wellington and Westport. Seven years later, they moved again, to Auckland, where George continued working as a builder/contractor. He was also a freemason. George died on July 18 1926 in Grey Lynn, New Zealand, and was buried two days later at Purewa Cemetary, Auckland. 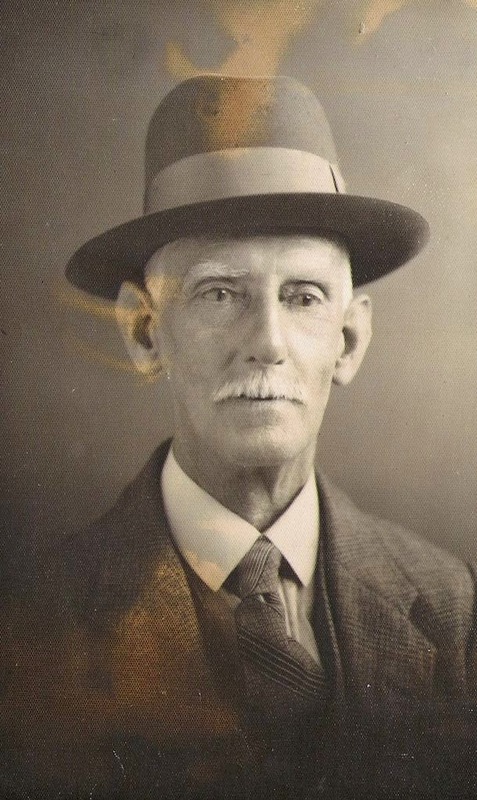 Eber Garner, one of my great x 3 grandfathers on my father's side, lived a long but almost certainly hard life. Like so many of my ancestors on this side of the family, he was a framework knitter. This was a difficult job - working the stocking frame took a lot of physical effort. The frame often needed adjusting, which - quite apart from the fact that that meant an interruption in work flow - also required good eyesight and, I imagine, a steady hand. The machine produced a flat piece of material which then needed making up into a stocking. It was often the women in the family - wife and elder daughters - who carried out this job, known as seaming. The machine took up a lot of space as well, similar to that taken up by an upright piano - taller, but not as wide. Which in a tiny two-up, two-down (if they were lucky) house, often packed full of children, would have made quite a difference. In addition, the hosiery industry was very unstable, with framework knitters often having to move from one part of the country to another to find work, or sometimes do something else entirely to avoid going into the workhouse. This was the case with Eber. He was born on 20 March 1825 in Thurmaston, Leicester, to John and Mary Garner, and was one of ten children. He married Mary Ann Robinson - sister of his elder brother's wife - in 1847. The 1851 census shows them as living in North Thurmaston with Emily, 3, and Eliza, 1. By 1861, they had moved to Hucknall in Nottinghamshire. My extremely knowledgeable friend, Jennifer, from the Thurmaston Heritage Group says many framework knitters left Thurmaston during the 1840s and 1850s following a general downturn in the trade. Many went to Nottinghamshire and Derbyshire - some even walked there, with their entire families in tow. These cities worked mostly with cotton or silk, instead of the wool that Leicester tended to focus on. This is reflected in the 1861 census return, in which Eber is listed as a cotton hose framework knitter. Mary Ann did the same job, and their two eldest daughters did the seaming work. There are now two sons in the family, John, 6, and George, 3. By 1871 Emily had left home, and Mary Ann was listed a housewife, although I suspect she was probably still involved in the framework knitting industry. Eliza, 21, and John, 16, were both framework knitters, as was their father. 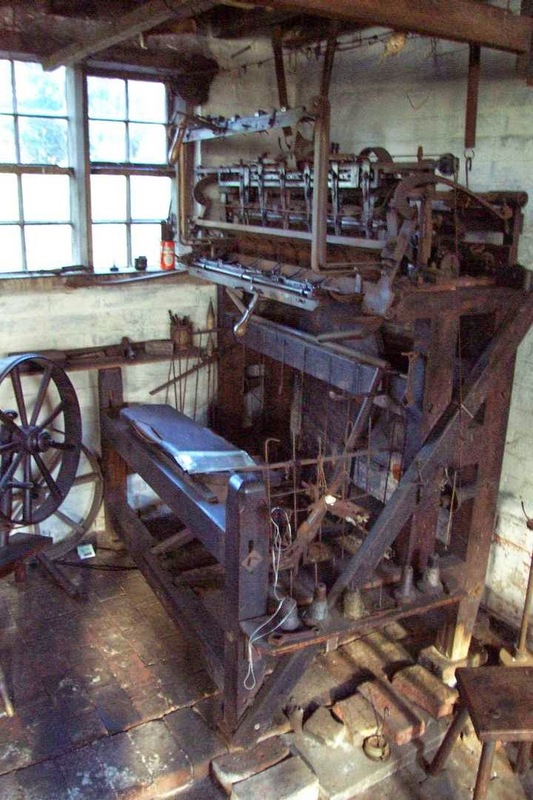 George was 13 and a winder - in other words, he wound the thread from hanks onto the bobbins. There were two more children, Sarah, 9, and Mark, 5. In 1880, son George - my great great grandfather - married Mary Goodwin in London. The certificate states that at the time Eber was a bag hosier. This was a middleman in the hosiery framework knitting industry who collected materials from the spinner or hosiery factory and passed it on to his workers who made up the goods. He then collected the finished articles from them at the end of the week and took it back to the factory, and of course charged a fee for his work. 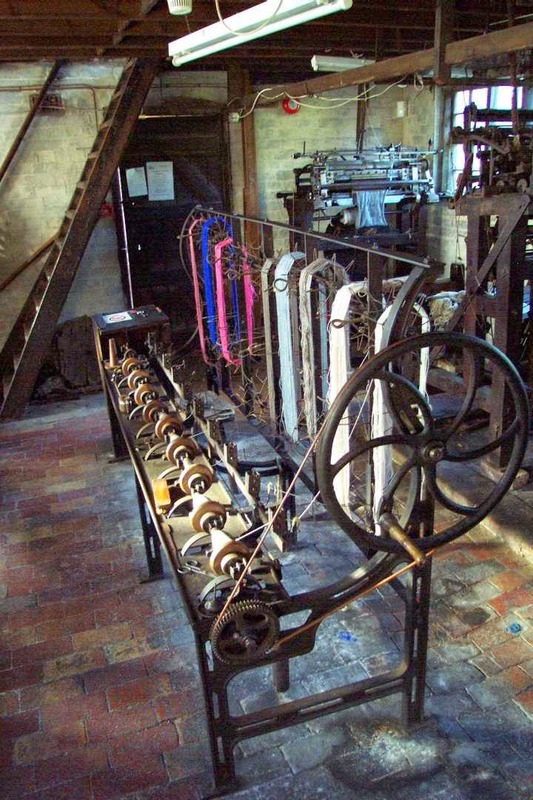 Sometimes the bag hosier had his own frameshop and charged the workers for the use of the machines as well. It was a very labour intensive industry and the end worker bore the brunt of all the charges. In Eber's case, he had four framework knitters in his home by 1881 - himself, his wife, John and Mark. Sarah was a stitcher. They were all making silk mitts. No doubt he did all the fetching and carrying of materials and finished items for them - I wonder if he did the same for his neighbours? I haven't been able to find a census entry for 1891, but from the 1901 entry it seems Eber and his family may well have fallen on hard times again, as Eber is now listed as a retired miner. He probably had to take whatever work he could get to avoid going to the workhouse. It must have been terribly hard, taking to the mines at around 60 years of age. In the 1901 census, he appears to be living with his son John and his daughter-in-law Emily, plus Emily’s five children by her first marriage (she was a widow), and their own son John. I'm not sure where Mary Ann was, to date I have not been able to find any record of her, although I believe she died in 1904. Eber died just a couple of months after the census was taken, aged 76.